The Duchess of Sussex and Queen Elizabeth were all smiles at their first official solo outing together. 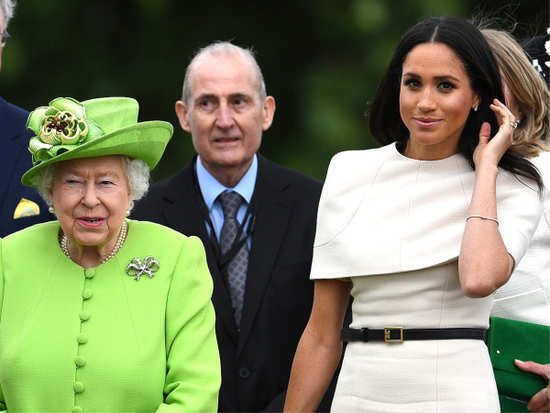 Meghan Markle, the Duchess of Sussex just had her first solo outing with the Queen and from the pictures we have seen, it seems like all went well. The Duchess of Sussex and Queen Elizabeth were all smiles at their first official solo outing together. The 36-year-old Duchess and Queen Elizabeth, 92, were in Cheshire on Thursday for the opening of the Mersey Gateway Bridge and Chester’s Storyhouse Theatre. Covering every inch of her shoulders this time, Markle wore a caped cream dress by the same French design house behind her wedding gown, Givenchy. The Queen wore a suit in her signature neon green designed by Stuart Parvin, who also designed her royal wedding get-up. But the best thing they wore were their smiles. In fact, the newly minted Duchess of Sussex appeared to make the Queen chuckle as she leaned toward her in one photo and the adorable giggly scene quickly made the rounds online as people pointed out that the two are already getting along famously. During the event, Markle and the Queen watched a drama performance by local students called 'Drop in the Ocean'. Queen Elizabeth also revealed a plaque to officially declare the bridge was open. There was also a moment of silence that paid tribute to the victims of the Grenfell Tower fire on its one-year anniversary. 'Zero' teaser: We couldn't have received a better Eid gift! Kylie Jenner deletes all photos of her baby girl, Stormi Webster on Instagram! Nick Jonas brings Priyanka Chopra as his date to cousin's wedding! 2'Zero' teaser: We couldn't have received a better Eid gift! 3Kylie Jenner deletes all photos of her baby girl, Stormi Webster on Instagram! 4Nick Jonas brings Priyanka Chopra as his date to cousin's wedding!